The Centre for Anti-Corruption and Open Leadership, CACOL, has reacted to the sentencing of Ex-Governor Jolly Nyame to 14 years imprisonment. 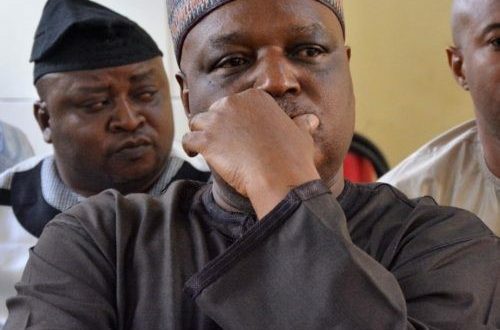 Recalls that a High Court of the Federal Capital Territory headed by Justice Adebukola Banjoko on Wednesday found Nyame guilty of corruption. However, reacting, CACOL, in a statement issued by its Executive Chairman, Mr Debo Adeniran, described Nyame’s conviction as a further reassurance that the Judiciary and President Muhammadu Buhari mean business in ensuring that no corruption culprit goes unpunished. The group added that, “It is gratifying to note that the anti-corruption crusade is gradually exposing those who have been hiding under the cover of religion, political power or social status. We have also seen others resort to one political alignment or the other, and some trying to bribe their way out of an on-going corruption trial just to frustrate the judicial system and the efforts of anti-graft agencies”.